This series an is update from Dr. Dean's Dispensations and Covenants (2000) series, now including video and graphics. The one doctrine that has opened up the scriptures to the largest number of people is the doctrine of dispensations. Many people have indicated that when they heard the doctrine of dispensations, God's plan for the ages, everything in the Bible began to make sense. Dr, Dean has put together a suggested reading list on Dispensationalism. Click here to download the document. 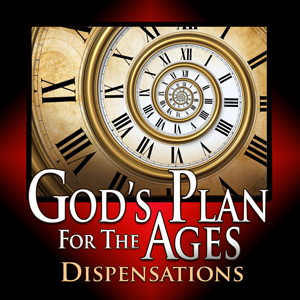 To view all video Bible studies in the God's Plan for the Ages - Dispensations series, click here. To listen to all current classes as a podcast, copy and paste the following URL into your podcast software. Psst... Come over here a little closer. How would you like a behind-the-scenes peek at God's plan for the ages? It's not really a secret. God has clearly revealed His Plan and it can be known by taking the Bible literally with the words meaning just what they say. Hear several thrilling examples of the exacting, literal way God fulfilled His prophecies in the past and be comforted knowing that all future prophecies will be enacted just as predicted. Learn the three essential elements of God's plan and how all other interpretations of God's Word can be measured against them. If a panoramic view of history is your cup of tea, then you're going to love this lesson. Starting in eternity past, see how God created angels and learn about the subsequent fall of Satan. With God's restoration of planet Earth and the creation of mankind came the Age of the Gentiles which ended with the Tower of Babel. Continue to the Age of Israel beginning with Abraham through the coming of Christ and completed in the future Tribulation. Stop and observe the great parentheses that takes place called the Church Age where we are today and look forward to the Messianic Age and Christ's thousand year reign on the earth. Examine the unique characteristics of each dispensation that demonstrate God's loving care for mankind. If your idea of angels are of little cherubic heavenly beings flitting around to help people, get ready for this true epic saga of angels and the rebellion of Lucifer. See how this resulted in the angelic conflict and the creation of mankind. Learn the role all humans have in this high-stakes undertaking. Examine the Creation covenant God made with Adam and the five mandates given to the human race. Find out the dire consequences that followed Adam and Eve's disobedience which reverberate to this day. Appreciate how God, in grace, provided the solution for sin. Powerful angelic beings seducing beautiful women resulting in half-human/half-angel offspring. Sound like a hair-raising, page-turning fantasy novel? Listen to this lesson to learn the original true account of this episode in the angelic conflict and how it led to the devastating flood in Noah's day. Learn about God's covenant with Noah and its six premises, including the death penalty and human government. See how once again mankind failed resulting in the Tower of Babel. Realize that although man fails, God remains faithful. From the shadowy pages of ancient history comes a man from a family of moon worshipers who believed in the one true God. Listen to this lesson to learn how God made a covenant with him that promised him a specific land, many descendants, and that he would be a blessing to all peoples. See how Abraham never owned the land during his lifetime but that this unconditional, irreversible promise will be fulfilled in the future. Realize that when you see the Jewish nation today it reveals how God is still working out His plans to bless mankind through Abraham. Please note that the beginning of this video is incorrectly labeled as Lesson #8. What do pomegranates on the hems of Jewish High Priests' robes have in common with the Mosaic Law? Listen to this lesson to learn about the 613 laws given to Moses and the Israelites who had been redeemed from slavery in Egypt. Find out the purposes of the Mosaic Law and how it clarified sin and showed the people their need for a Savior. See why the Mosaic Law is not still in effect today. Learn about the warnings God gave the Israelites of five cycles of discipline if they disobeyed as a nation and see how these horrific consequences have played out in history.